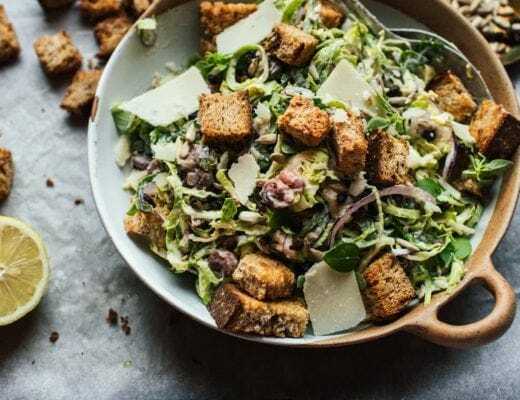 This post was created in partnership with Barilla Pasta – they’ve got an amazing competition on at the moment where you can win £1,000 of British Airways vouchers to use towards a weekend trip to Italy (that would be my dream come true!) – to enter you just have to post a pic of a pasta dish either on the comments of this post on Barilla UK’s facebook page OR on instagram using the hashtags #OutsideTheBox and #BarillaUK. Just think of all the pizza and gnocchi you could be eating *weeps tears of joy*. Now onto the recipe! 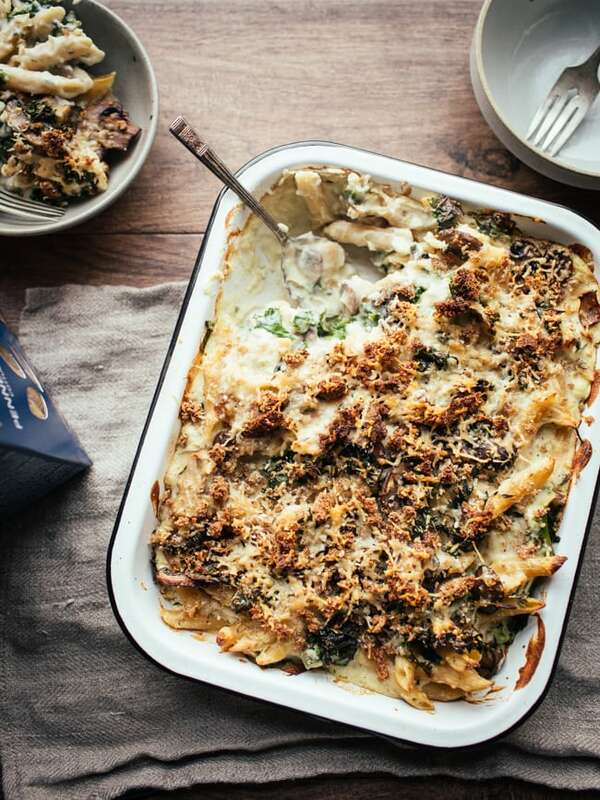 If you are as much of a pasta bake fan as I am, you’ll love this post. The upside is the comfort food that always seems appropriate to cosy up with. Miso soup, pie and big bowls of porridge are all top favourites. Anything baked ticks two boxes because a) it’s probably going to involve hot carbs and b) If I close the kitchen door whilst I’m cooking, the whole room gets warmed up and I don’t need to wear a jumper for once! 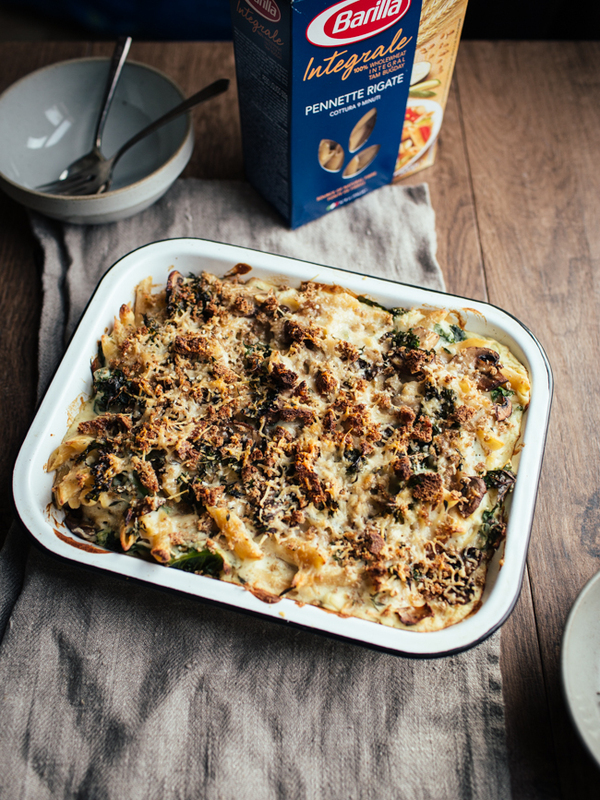 It won’t come as a surprise that pasta bake is a definite winter winner for me. You can pack in loads of veggies so you feel relatively healthy – I even snuck cauliflower purée into the sauce because I’m all about that vegetable/fibre life plus it makes it even creamier! I used Barilla’s wholemeal penne pasta and I have to say, it’s my favourite wholemeal pasta I’ve ever tried as it still has a perfect texture (despite the bran) and a light, nutty flavour. As eating dairy-heavy foods can give me stomach cramps, I prefer this cheese-light sauce to something like classic mac and cheese. There’s just a sprinkling of parmesan on top which packs in the umami tang without needing half a block of Cheddar. Garlicky mushrooms and hella fresh thyme bring the flavour in and a scattering of breadcrumbs on top give it that irresistible crispy topping. It’s a perfect dish to shared with friends on a weeknight or Sunday evening when you’re in need of some proper, hearty food. Bring a medium pot of salted water to the boil. Add the cauliflower and potato. Bring back up to the boil over a high heat then turn the heat down to simmer – leave to cook for 8 minutes until the cauliflower and potato are soft. 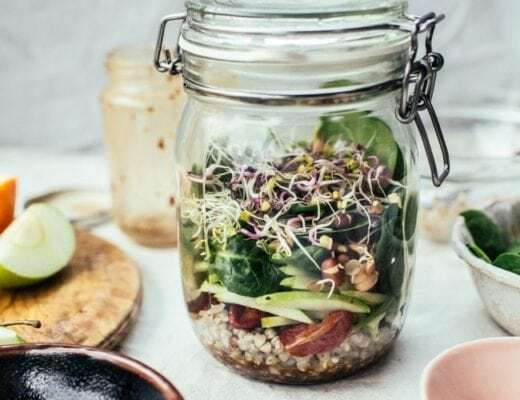 Use a slotted spoon to remove the cauliflower and potato from the water to a large jug or bowl – set aside for later and keep the pot of water on the stove. Add the pasta to the pot of water and bring back up to the boil (add more water to the pot if needed to cover the pasta). Once boiling, turn the heat down to simmer and leave the pasta to cook for 5 minutes until only just barely cooked on the outside with an uncooked centre. Drain the pasta and rinse it under cold water in a colander. Set aside in the colander for later. Return the pot to the stove. Add 2 tbsp of olive oil to the pot along with the flour. Stir over a medium heat until smooth and cook for 1 minute. Combine the milk and stock together in a jug – gradually mix this liquid into the flour-oil paste in the pot, stirring in between additions until smooth. Once all the liquid has been added, bring the mixture to a simmer over a medium-low heat and let it cook for 2 minutes – it won’t be very thick right now but don’t worry! Pour the hot contents of the pot and the tablespoon of mustard into the jug/bowl containing the cauliflower and potato. Blend using a hand blender until completely smooth and thick. Season to taste with salt and black pepper. Set the sauce aside. In a medium frying pan, heat the remaining 1 tbsp of olive oil over a medium-high heat. Add the mushrooms and let them cook, stirring occasionally until they’ve shrunk down and are releasing liquid (about 5 minutes). Add the garlic, thyme and a pinch of salt to the frying pan, turn the heat down to low and cook for 1 minute. Add the kale to the frying pan and cover with a lid or large plate. Leave to steam for 5-7 minutes until the kale has wilted down. Remove the lid and take off the heat. 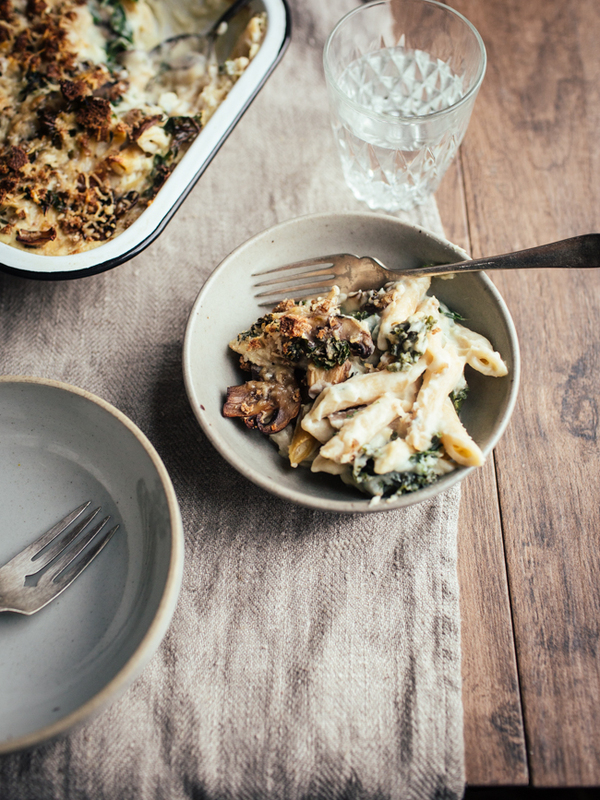 In a medium casserole dish or roasting tin, mix the pasta, mushrooms, kale and sauce. Mix the topping ingredients (except the olive oil) in a small bowl and sprinkle over the pasta. Drizzle with some olive oil, slide the dish into the oven and bake for 20-30 minutes until the topping is slightly browned. Divide between bowls and serve hot. 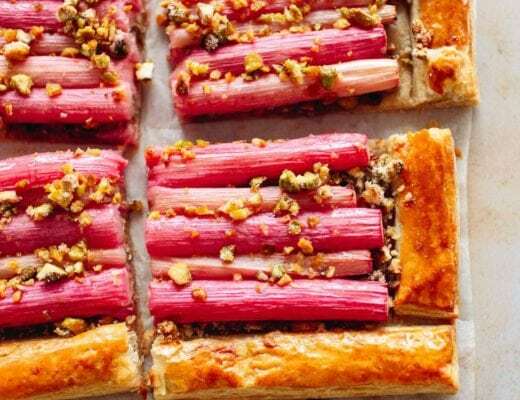 - To make this vegan: omit the parmesan from the topping and just season with some flaky salt and nutritional yeast instead. Use unsweetened, non-dairy milk in the sauce. 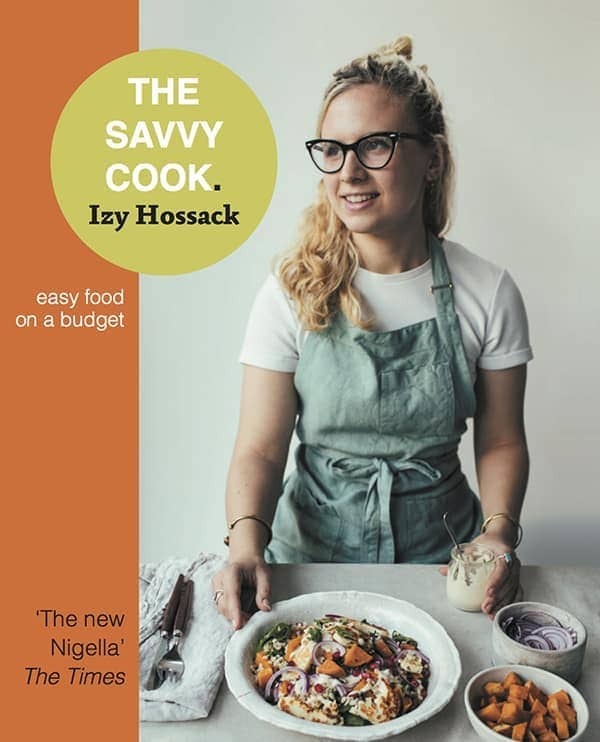 - To make breadcrumbs: take one slice of bread and rub it on the coarse side of a grated to shred it into coarse breadcrumbs. This looks like my ultimate dream meal. 🙂 I’ve already pinned it. 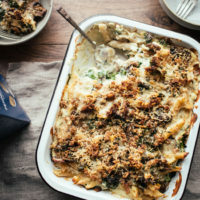 Love a pasta bake and this one sounds delicious! Pasta! It’s my all time fave and my nieces’ as well. Love to try this one. Sure they’ll love this too! Thanks for sharing the recipe! Keep more recipes coming! I’m eating this right now and daaaaamn, it is amazing ? Who wouldn’t love pasta bake? I love it. It looks so delicious!! I would happily swap seasons with you (i’m a child of winter – summer is figurativley killing me) I would love to be eating this right now on a winter night – its too hot to be eating anything other that popsicles right now. I’m a pasta bake fan. I am definitely going to try this. Thanks for sharing.